Happiest of Fridays to You!!! 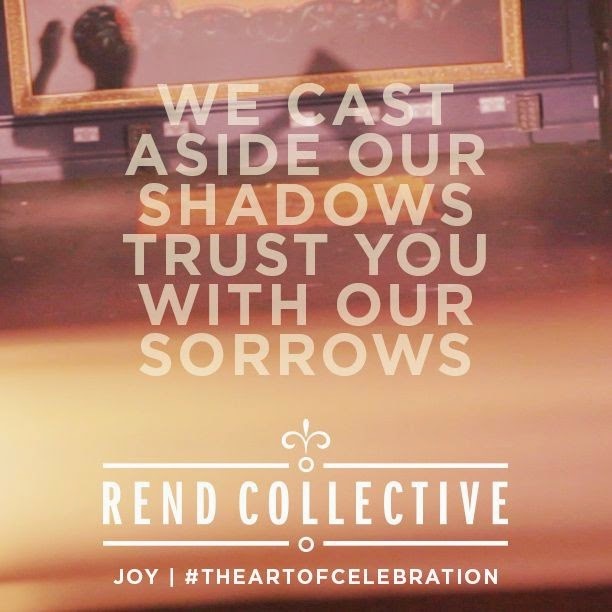 This past Sunday, my cousin treated me to see Rend Collective as they opened for Kari Jobe. I counted down the days to see them, and when the day arrived I was beyond excited. After their loud, rambunctious, and festive opening song they shared a thought that left: "We are not Worship Leaders, we are worshipers and the Holy Spirit is the worship leader." From that moment, the hype of seeing Rend Collective fizzled, and a greater emotion evolved for the worship that was about to come. For that hour I was an Irish worshiper, lol. They released The Art Of Celebration, their latest album, this Monday on St. Patrick's Day... genius! (only $9.99 on iTunes) It's a gem! The Holy Spirit definitely orchestrated each word, strum, and beat, to compile a collection of artistry and beauty. His fingerprints are all over the album, and theological truth is embedded in the core of each song. Thank you guys for not leading, and allowing Him to create something marvelous in and through you. A man learns a lot during the lead up to his wedding. I learned that the women in my life have very strong, informed opinions about things I didn't even know were things. I learned how to fake having opinions. I learned that my family and friends are even more supportive, caring and generous than I had previously dared believe. I learned that my wife still radiates grace and beauty when she's under stress. And I learned that joy is a discipline and celebration is an art form. You would think that joy and celebration come naturally and don't really require effort, as though they are our default factory setting. And I think maybe this was true until Adam and Eve made that earth-shattering decision in the garden. All I can say is that now there is nothing automatic about joy. That's why planning a wedding celebration takes so much effort and preparation, and why "party planner" is a real occupation. If everything in our world is not perfect and there isn't an abundance of cake, balloons, fireworks and confetti, you just can't trust humans to choose joy. Since the fall, negativity and cynicism have become our "go-to" states of mind. God knows this about us. That's why there are so many commands to celebrate in the Bible. Think of the Old Testament Law... God's people are told they must have a Passover feast, that they must have a "Year of Jubilee," that they must have a day of Sabbath rest. The Psalms are full of exhortations to sing at the top our lungs and jam out on the psaltery (whatever that is!). Even Communion, the time during which we remember Christ's sacrifice, is not a time of mourning. It takes the form of a feast with friends. He wants us to choose celebration. He commands us to choose celebration. I know we all experience heartbreak and sorrow. I don't say this lightly. But "the joy of the lord is your strength." Even in the shadows and the sorrows, we always have a reason to sing. Even if it is the "cold and broken hallelujah" Leonard Cohen sang about. Jesus and his gospel are still worth celebrating: choose joy in defiance of your suffering and lift up your trust as a song and an offering. This is the discipline of joy. This is the art of celebration. Hello! I have nominated you for “Shine On and Versatile Blogger Award” please follow the link for more info http://helloscar.wordpress.com/2014/03/21/shine-on-versatile-blogger-awards/ Congratulations!! !